Build brand visibility everywhere you go with attractive, durable branded vehicle wraps! 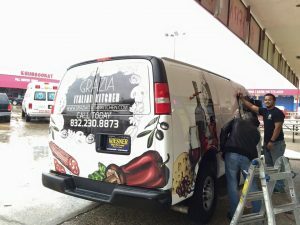 One of our favorite tasks here at New Modern Sign is custom auto wraps, decals, fleet graphics, and vinyl auto graphics for business vehicles. You can now take your business everywhere you go, marketing yourself and your services to potential clients. 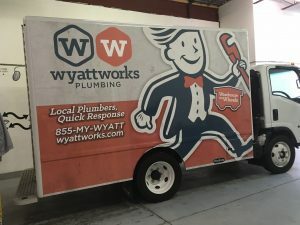 Vehicle wraps turn your vehicle into a mobile advertisement for your company, increasing your brand awareness in your local market like no other marketing method can. 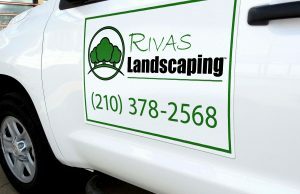 Call New Modern Sign at (713) 597-2944 for your Free Consultation with a Vehicle Wrap Specialist! 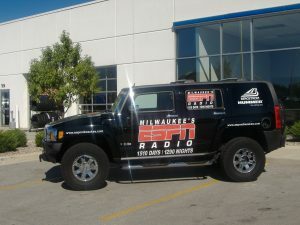 Vinyl vehicle wraps publicize your business while increasing customer confidence and perception of your brand. 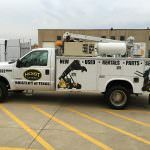 If your business requires you to make house calls, like cable installers, electricians, plumbers, or exterminators, homeowners may think twice before opening their doors if they aren’t sure what company you represent. A branded corporate vehicle tells clients you are who you say you are, allowing them to feel more comfortable with welcoming you into their home. Fleet wraps are can be used across all industries. 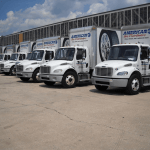 Those that find the most value include delivery vehicles, trucking companies, handymen, cable companies, plumbers, repair techs, electricians, landscapers, tutors, dry cleaners, and any other industry that commonly uses vehicles to perform business functions or duties. Full wraps, while making the biggest marketing impact, are not always feasible for every businesses needs. You may have a smaller budget, or require a more subtle approach. 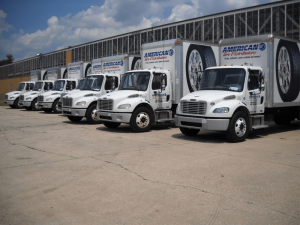 Regardless of the level of wrapping and the number of vehicles, we can provide a solution that meets your needs. 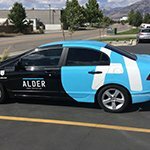 Partial vehicle wraps allow you to pinpoint a specific part of your vehicle to use for promotion.This may be a specific part of your car, such as your side panel, door, bumper, tailgate, or hood, or could be a more general area such as back half or front third. When applied to full panels, partial wraps provide the same attractive, seamless look as a full wrap at a fraction of the cost, making them a good choice for many cash-strapped or new businesses. 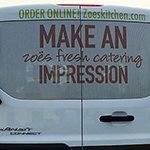 Individually cut vinyl graphics are also easy to apply to vehicles, making them a popular choice for those looking to share a specific, bold message. 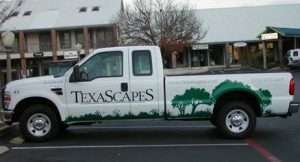 Vehicle graphics can also be used as a complement to a partial wrap to take the branding across the entire vehicle. These are more versatile than full wraps in that they can be easily removed and more simple designs can even be self-installed, however they will not provide the seamless appearance of a full wrap or panel wrap. 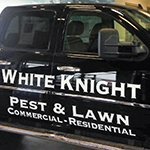 If you are only looking to add a single logo image or minimal text, such as basic business information, this can easily be done with attractive vinyl lettering and graphics. 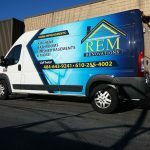 If you don’t want a permanent advertisement on your vehicle, magnets can be a great alternative. These marketing tools are popular for private contractors that may represent multiple firms, for those that live or frequently travel to signage restricted areas, and those who sometimes use their personal vehicle for business purposes. Easy to remove and replace, these are the least labor intensive option. 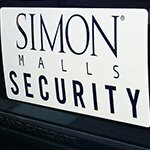 There are many options available for customizing the size, shape, and color of the vinyl covering over the magnet, however there will be a noticeable gap between the print and the vehicle itself. 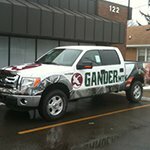 From work trucks to corporate yachts, we can wrap any type of vehicle with any design, pattern, or information. Whether you already have a wrap design in mind, or need assistance with the perfect layout, New Modern Sign will handle every stage of your wrap project with skill, accuracy, and a creative approach. We create attractive vehicles that are cohesive with your interior sign and exterior signs for your business, ensuring that you have a consistent brand message no matter where you are seen. Since we are in Houston, your business promotion isn’t limited to the land! We can also provide marine-grade vinyl for your boat or watercraft. Durable and long-lasting, vinyl boat wraps won’t wear off in saltwater or sand, and when properly maintained, can last for many years. 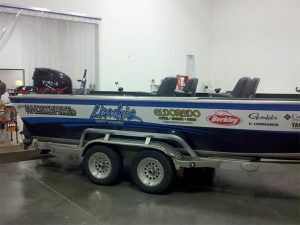 We can create full boat wraps, boat graphics, or even lettering proudly displaying the name of your vessel and your licensing or boat identification information. Full boat wraps are a great option for marinas and clubs that provide boat rental services, as it not only allows you to easily identify your fleet, it serves as a promotional tool when on the water, and can help to protect the exterior of your boat when captains may be less experienced. Even if you don’t have a boat, any business that operates near the beach should consider having a protective, marine-grade wrap applied to their business vehicles. New Modern Sign is a full-service vinyl wrap manufacturer, handling every stage of the wrap process from consultation to installation. 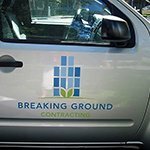 Regardless of your vehicle type or desired coverage level, we will provide attractive promotional graphic options to meet your budget and needs. Our staff of experienced installation experts understand the importance of proper application for an attractive finish that complements your brand, and is attentive to detail. New Modern Sign is ready to assist you with all of your vehicle wrap and graphic needs, from single magnets to entire fleets of semis. We provide complete business signage services, and hope to become your long-term provider for all of your sign needs, both now and in the future.